The global demand for fish is suffocating our oceans. More than 55 percent of the seawater that covers this planet is trawled or lined with hooks in some manner, and increasingly under dubious legal circumstances. Unbridled international competition and demand continue to drive many local and commercial fisherman to make desperate choices in order to meet their quotas – some even setting a course for Marine Protected Areas (MPAs) to fill their hulls. For many, it’s a question of whether they’ll be able to afford a roof over their head and feed their families. For conservationists, on the other hand, it’s a question of whether some fisheries will be able sustain this demand in twenty years… or ten, or five, before collapsing entirely. New and cutting-edge ways of telling the story of overfishing are helping diagnose the scope of the issue with startling visualizations. They also serve as a model for visualizing complex, global issues that are inextricably linked to large systems like commerce and transportation. Storybench put together a roundup of six visualizations that explore overfishing. Seen in National Geographic and Vox this past month, AIS, or Automatic Identification Systems, are legally required to be present on all large vessels traversing the seas. Skytruth, a geographic information organization, utilized responsive satellite technology through Google mapping to relay positional data on 35,000 of the world’s largest vessels. The results have proved to be eye opening. Funded by conservation group Oceana, the technology has now been used to investigate illegal fishing activity. Appropriately named ‘dark ships,’ these marine bandits may not be able to hide for long. Thus far, this initiative has discovered an alarming number of suspected poachers seen disengaging their onboard AIS system upon their approach to local MPAs. After several days, the same vessel is often spotted appearing on a different side of the MPA, en route to its home port. 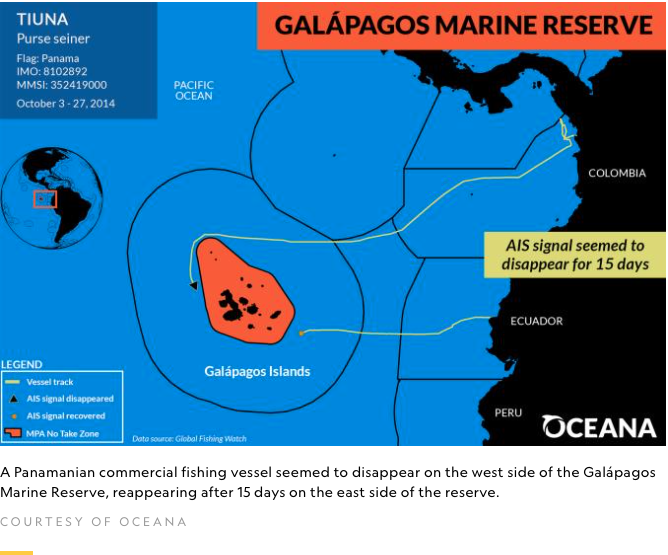 This geospatial information likely indicates illegal take from areas like the Galapagos or the Great Barrier Reef. However, as National Geographic’s Sarah Gibbens notes, it is possible that some of these ships could be evading pirates in other hot spots, such as off the Somalian coast. Keeping this caveat in mind, such technology has begotten a new “eyes in the skies” brand of investigation, wherein detectives from Global Fishing Watch identify fishing activity from the course and movement pattern of vessels within an area. Couple this with a few coordinates and you can identify who may be stealing cookies from the cookie jar. 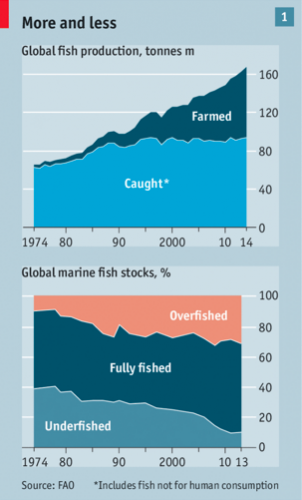 These UN FAO area graphs used in a 2017 article by The Economist shows how much of global catch is, while legally obtained, culled unsustainably, thereby framing the problem as one driven by demand. 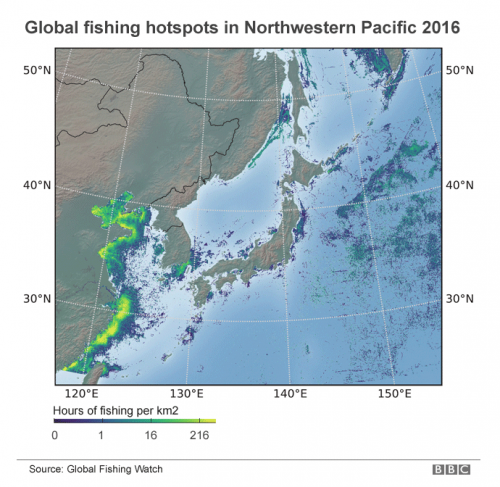 BBC’s Jonathan Amos wanted to elucidate just how small the ocean has become to the global fishing market. 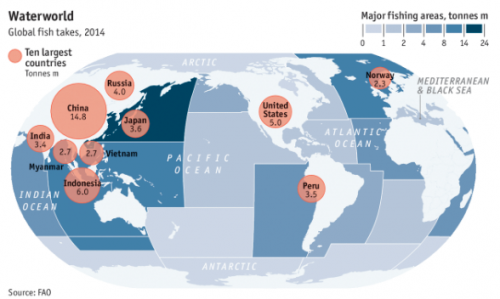 The following maps from Global Fishing Watch helped him show that more than 55 percent of the ocean is already tapped for large-scale fisheries. 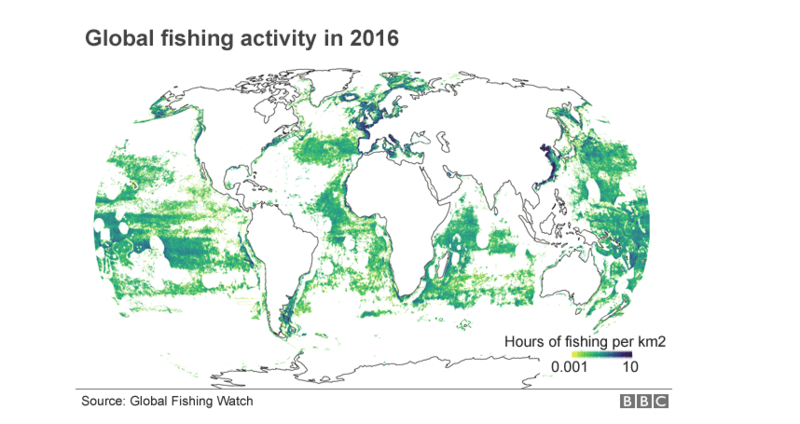 The brilliance of this AIS data use is that it showcases the extent of fishing activity as a function of hours of fishing per square kilometer. It’s a motif of the stranglehold we have on our ocean. 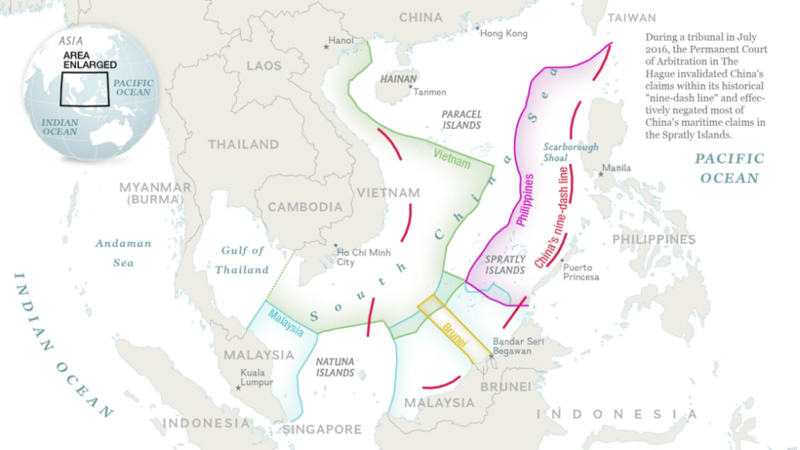 Claims to fishing territories overlap in the South China Sea, and have been only getting worse. The region is a hot zone for economic rivalries – mainly between China and a host of neighboring countries, as the People’s Republic casts a larger net each year. 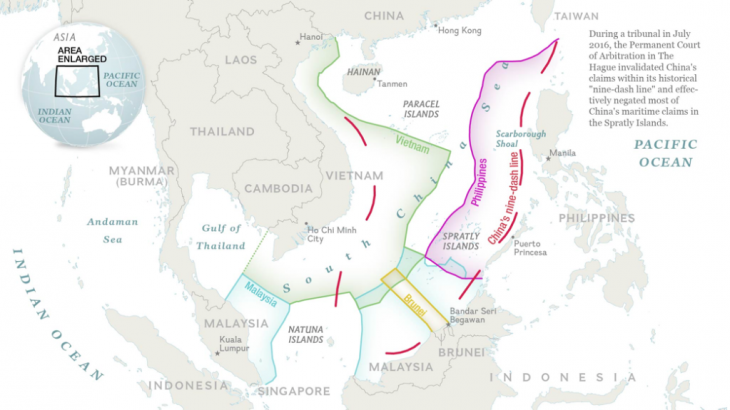 For the politically minded, the map below – sourced from the Center for Strategic and International Studies – gives us an idea of the extent to which the world depends on fish as a commodity. Yet for those concerned about the increasing stability of the marine environment, such a figure illustrates the marine footprint each of these zones imposes. Seeing this map for the first time, one may note the heavy resource drain implicit along economic zones that overlap. Instead of pointing out the countless areas of overexploitation, publications like The Conversation draw our attention to the areas of protection. 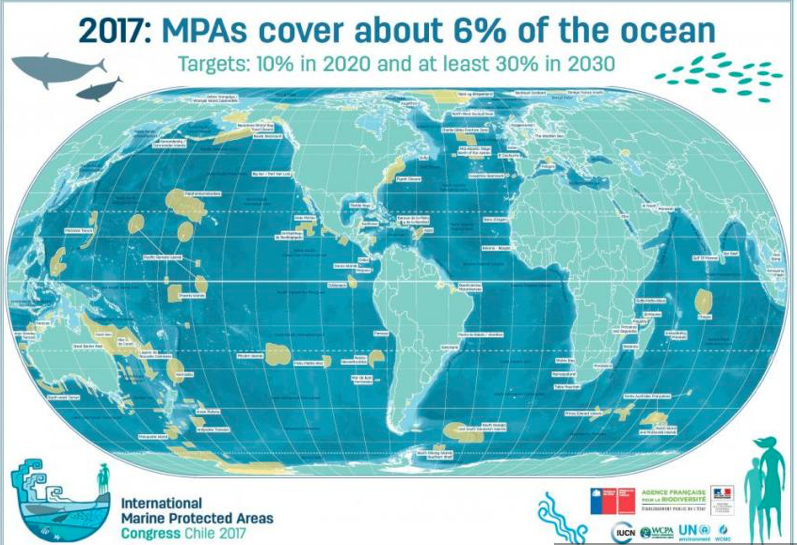 Their question: “Are these areas meeting international goals?” Author Rebecca Gruby, from CSU’s Department of Human Dimensions of Natural Resources, argues that the international community is not on track to fulfill its 2020 goal of designating 10 percent of the ocean as MPAs. She notes that the globe’s protected only 6.4 percent of its oceans to date. And so, with only two years left to meet this goal, it seems unlikely that we will see the 2020 plan realized. 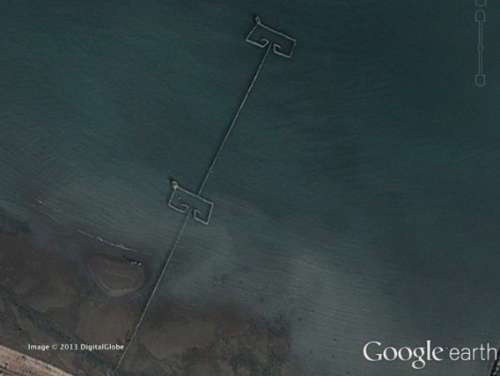 While Google Maps is nothing novel, it’s kept pace with researchers looking to answer the question of where dwindling fish stocks are being further drained with new, unsanctioned harvesting techniques, like in this article by The Atlantic’s Todd Woody, written about Iran’s use of illegal weirs – large structured used to catch fish – and how the country’s annual catch report to the UN was grossly misrepresented. For smaller countries that are contributing to the problem of overfishing, pointing fingers at Japan, South Korea, China, or the U.S. can be an easy way of evading responsibility. As late night host John Oliver would say, this is “whataboutism,” and it’s wrong. We all need to do our part to restructure market demands. In other words, framing “the take” by country, while necessary, should not be the first piece of evidence in the conversation about overfishing. In spite of this, it’s important to keep tabs on where the lion’s share of fish is going.